Dental cleanings are the gentle removal of plaque, calculus and stains from the tooth structures. They are intended to remove irritants from the teeth. Regular cleanings help keep gums healthy and teeth cavity-free. A dental cleaning includes removal of tartar and plaque and having the teeth polished to remove stains and further buildups of plaque that are not removed when regular tooth brushing is performed. Fluoride is a mineral that is found naturally in water and many foods. Fluoride builds up teeth’s strength against the acids that cause cavities and tooth decay. The ADA (American Dental Association) encourages fluoride treatment, stating that professional fluoride treatments are beneficial and are best utilized as part of a comprehensive preventive program in the dental office. Dental sealants are a safe resin material applied to the surfaces of children’s teeth (commonly permanent molars) to prevent cavities. Sealants fill in the crevices of an erupting tooth and “seal” off the tooth from cavity causing agents like food and plaque. The sealant is painted directly on the chewing surface of the teeth and is then light cured. Oral cancer affects thousands of Americans yearly. Dr. Sherman will complete a thorough clinical exam of all the oral tissue to check for any changes in the tissue consistencies and/or lesions. With early detection, cancer may be caught before it has time to spread, potentially saving lives. An oral evaluation is recommended every three (3) to six (6) months to prevent cavities and other dental problems. 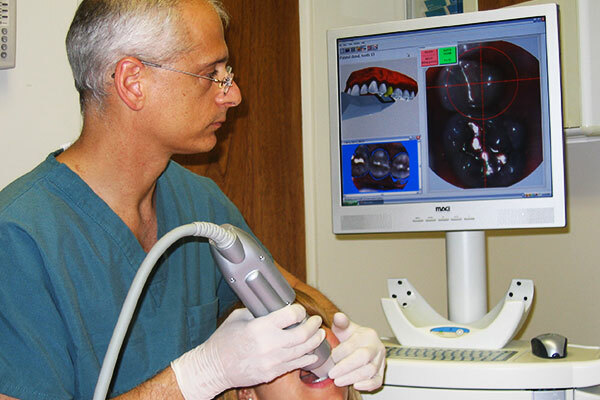 During an oral evaluation, a thorough examination is done to check the hard and soft tissues of the mouth. Dental X-rays are a valuable diagnostic tool used to identify decay, extra teeth, bone defects, tumors, cysts, infection and check the progress of previous procedures. Latest technology now allow for digital X-rays, which reduce radiation exposure more than 50 percent, and produce instant, high-quality images that can be viewed immediately by the dentist and the patient. After cavities are cleaned, a composite filling is used to restore the areas that bacteria leave behind when they infect the tooth. Composite fillings are safe and shaded to match the color of the tooth. Dental implants are used to replace missing teeth and roots and can provide a strong foundation for fixed or removable replacement teeth. Implants are small titanium posts that are surgically placed into the jawbone where the teeth are missing. The bone bonds with the titanium, acting as a tooth root substitute. Posts are attached to the implant allowing for dental prosthetic attachments. Once the implant have been placed and healed, our office will place implant restorations such as crowns, bridges and dentures to the already placed dental implants to complete your new smile. Porcelain veneers are thin pieces of porcelain used to recreate the natural look of teeth. To place a veneer, a very small amount of the original tooth enamel must be removed. Once it is applied between the slightly prepped tooth and the veneer, the adhesive layer is then hardened with a curing light. Whitening, also known as bleaching, is the procedure used to brighten teeth. There are two different ways to achieve a desired whiter smile, In-Office Whitening and Take-Home Whitening. In-Office Whitening usually requires only one office visit. A protective gel or a rubber shield is placed over the gums to protect the soft tissue. A whitening agent containing carbamide peroxide is applied to the teeth, and a visible light is then used to enhance the action of the whitening agent. Take-Home whitening employs specialized UltraFit® trays which are prefilled with the whitening agent and use body heat to mold themselves to the shape of your teeth. This provides a custom fit that provides maximum coverage of all the teeth and also eliminates the mess associated with traditional at home whitening products. These trays need to be worn only 15 – 20 minutes a day. Oral appliance therapy involves the selection, fitting and use of a specially designed oral appliance that maintains an open, unobstructed airway in the throat when worn during sleep. These are indicated for patients who have been diagnosed with Obstructive Sleep Apnea (OSA) and have been unsuccessfully treated with a Continuous Positive Air Pressure (CPAP) machine. Nitrous oxide, sometimes referred to as “laughing gas,” is an effective and safe sedation agent that is inhaled through a mask that fits over your nose to help you relax. Mixed with oxygen, nitrous oxide allows you to breathe normally through your nose and within minutes you should start to feel the effects. You may feel light-headed or a tingling in your arms and legs. Some patients comment that their legs and arms feel heavy. Ultimately, you should feel comfortable and calm. The effects of nitrous oxide wear of quickly after the small mask is removed. Talk to Dr. Sherman about whether nitrous oxide would be a good option for you.